How bout a nice pick me up? 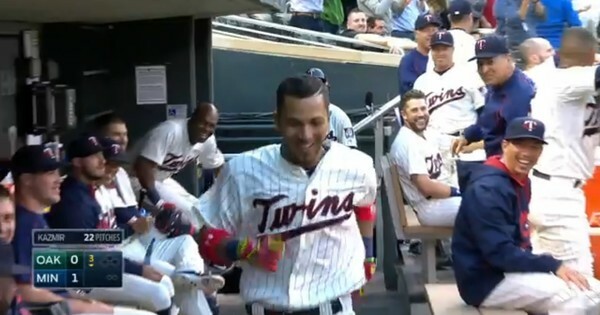 They say you only get one opportunity to make a first impression, and as Deadspin reported before today, Twins Rookie Eddie Rosario made an unbelievable start to his MLB profession yesterday when he hit a home run on his initial pitch. Given the home run came in the third inning of a match that ended up in a 13-0 win over the Oakland A’s, but that is beside the point. The actual story here is that the family of Rosario was in the stands after flying up from Puerto Rico. It is difficult not to observe the complete delight on the face of his family as they fight to keep their cell phones leveled, wailing their hands as they attempt to gain Rosario’s first at bat on their cell phones. Take a look at the GIF below and strive not to feel exactly the same sense of delight they do.